Her Unforgettable Laugh starts several years before P&P’s story with Mr. Wickham trying to abduct Georgiana. 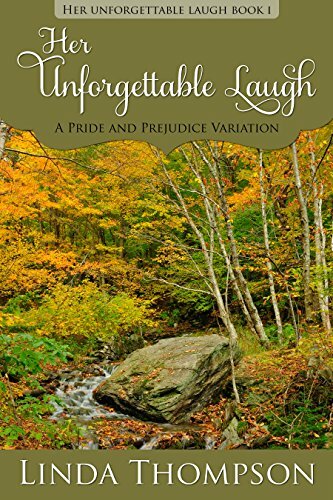 During this attempt, she is saved by Elizabeth but because while doing so she behaved in an unladylike manner, Elizabeth is rapidly taken away by her aunt and all Mr. Darcy can grasp from her is her laugh. The story then resumes the events we see in P&P starting at the Meryton Assembly, instead of saying Elizabeth is not tolerable enough to tempt him, Mr. Darcy hears her laugh and invites her to dance with him in an attempt to ascertain if she is the lady who saved Georgiana all those years ago. As you can imagine, this will change the entire story, and their relationship will not go through such a bumpy road. Some of the characters have interesting changes in this book, we see a side of Mr. Hurst I had never seen before and it was very refreshing to see such a portrayal. Miss Bingley on the other hand is a conniving and evil character, to the point that everyone knows what she is planning all the time, and Wickham is very malicious person. Mrs. Bennet is also an exaggerated mean and obnoxious character and unlike Wickham’s character, I didn’t like her at all. Darcy is not so proud as we are used to and accepts his feelings for Elizabeth almost immediately, so there aren’t many obstacles to Elizabeth and Darcy’s love, which made the story a little too slow paced for me. However, readers who love a smoother love story without much angst or obstacles will absolutely love this book. It is a sweet, uncomplicated story where the conflict doesn’t come from Darcy and Elizabeth’s feelings and attitudes but from the villain’s actions, namely Wickham and Caroline’s. I usually prefer books where the conflict comes from their feelings, so I would say this book is more directed to readers who prefer external obstacles. If you like books where ODC join forces to fight against external obstacles while having sweet and tender moments between them, then this book is perfect for you. I like a balance of the internal and external conflict. If I had to pick, I think I lean toward the external, but I can be wowed by a good angsty one, too. I hadn’t heard of this one so I’ll have to mark it on my wish list. Rita, that was a delightful review. I love it when ODC can work together against external forces. I have had this on my wish-list since forever hoping for a reduction in price. I hope there will be a sale on day. Thanks for sharing your thoughts on this work. I think this is book one of a trilogy. Will you be reviewing the other two in the series? It is part of a trilogy, but this story has a closure of its own and I don’t think I will be reading the other two anytime soon. I prefer the internal conflict to the external one so I would not put this one among my favourites, which is why I may take a little bit longer to read the other 2 stories. But when I do I will certainly review them and let you know Jeanne, also if I ever see this on on sale, I’ll make sure to share t with you! Sounded lovely. I love the premises as I prefer it to be them against outside obstacles rather than them at odds. I can understand why you thought this was slow moving and would have preferred a little more sprinkling of angst between ODC. I,too,prefer when they have to travel a stony path,it makes the journey more interesting and their destination,of a HEA,so well deserved.